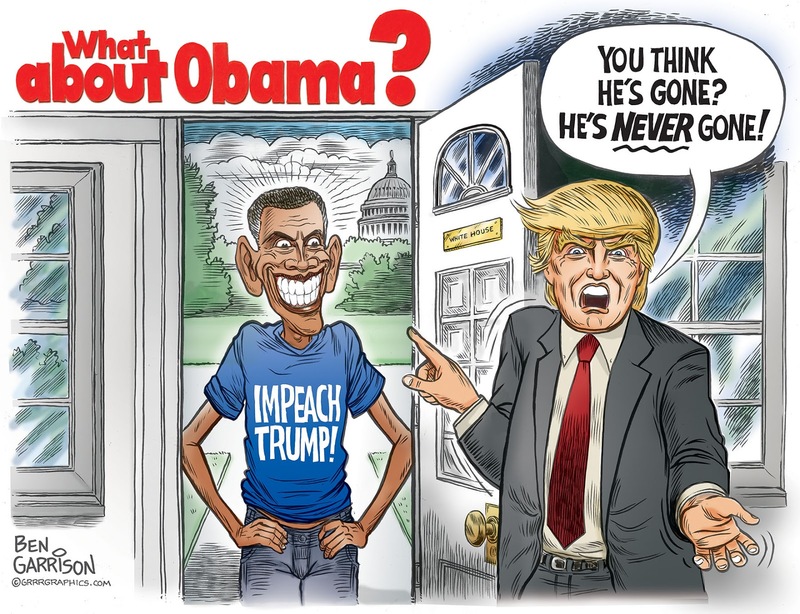 Rogue Cartoonist: What About Obama? George W. Bush rarely criticized his successor to the presidency, Obama. Barack is not about to follow that precedent, unfortunately. He is driving very hard to the hoop to destroy Trump. He may have even wiretapped Trump Towers. What Barack is doing amounts to sedition. Like the Clintons before him, Obama got wealthy in office. He’s also aligned with the billionaire, George Soros, who is eager to help fund Barack’s mischief. Utilizing big money and connections, Obama will try to guide America back on the road toward globalism. Unlike Obama, Trump does not want to be president of the world. He wants to help America first and Obama can’t stand that. We’ve had enough of Obama. He did his best to destroy America during his two terms. Now he’s directing his energy toward destroying President Trump. Similar to the main character in the film, ‘What About Bob?’ Obama simply won’t go away. Like the Clintons, he can’t give up his addiction to power. So get ready to endure Obama and Hillary ad nauseam. They refuse to go away. They both deserve to have the America’s door slammed in their smug and entitled faces. What About Obama? Lock him up--along with Hillary.